What a stormy Saturday! 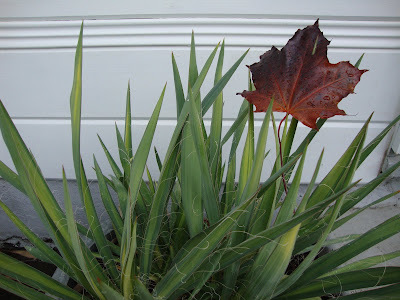 This yucca stands guard by our backdoor; the blustery wind impaled a fall leaf on one of the spikes. In between the weekend downpours I managed a few minutes in the garden. Time to get the patio furniture under cover, hate to admit it but there will be no relaxing glasses of wine consumed on the patio for a few months, might as well protect the wood from the rain. Some of potted plants that can tolerate the cooler temps, (currently low to mid 40’s at night), but would rather not deal with the rain (we received over an inch on Saturday alone) will spend time under the shade pavilion. The ones on the outer edges get a bit of moisture but the ones in the center stay dry. The long-term plan is for rigid plastic sides to go up in the winter so the pavilion can act as a sort of greenhouse. 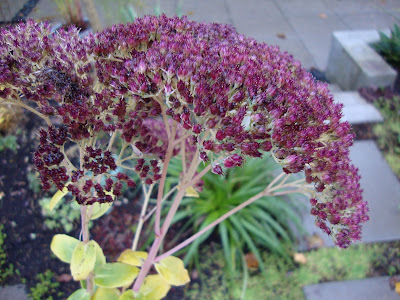 I cut back the Sedum ‘Autumn Joy.’ I claim to have a love/hate relationship with this plant; one of the things I love about it is the combination of its dying foliage and blossoms…yet at the base, the earliest possible sign of the spring to come. This plant already has faith in the next gardening season! 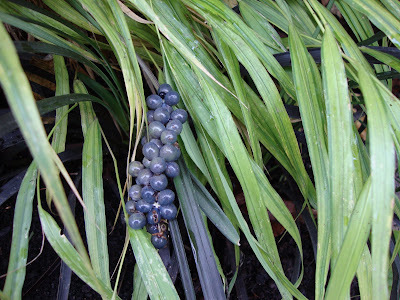 Removing decaying Hosta leaves (I try pick them up before the slugs move in and lay claim to the territory) uncovered berries from the Back Mondo Grass (Ophiopogon planiscapus nigrescens), aren’t they beautiful? 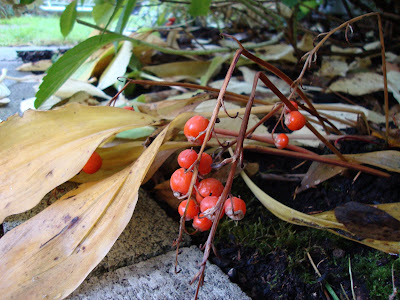 And I found these orange beauties from the Lily of the Valley, lurking under the heavy hydrangea branches. And then it started raining again…time to head inside and warm up. 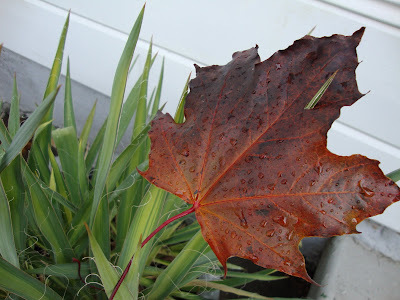 How have you managed to only have one dead leaf in your garden? Hi Loree~~ That was some kind of rain, wasn't it? I keep reminding myself that this is what it's supposed to do in November. I've always admired those tiny little rosettes emerging much earlier than you think they would. I've got an Acacia that blooms in March. It began setting buds this past August. It's nice to have our plants remind us that although it's bleak now, fair weather isn't far off. 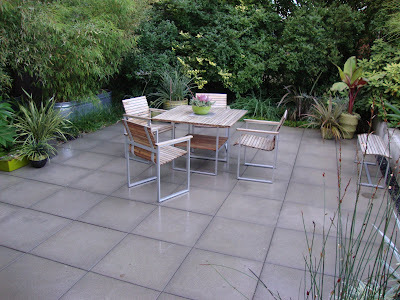 I LOVE your patio! 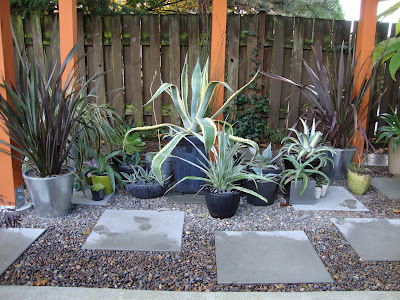 I don't think I've seen a photo of your Agave/Phormium collection. Looks dangerously delightful. Grace, the collection as you see it in the photo is never grouped like that normally. Only for the "hunker down" weather. The rest are now in the basement, I should share a photo of that scene. It's pathetic. Funny thing, I was looking at Agave this very afternoon. I love them but know they'll suffer from the winter wet rather than the cold (zone 8 here) so I'll buy one in spring. Less work moving it around you see. You're right about sedum. 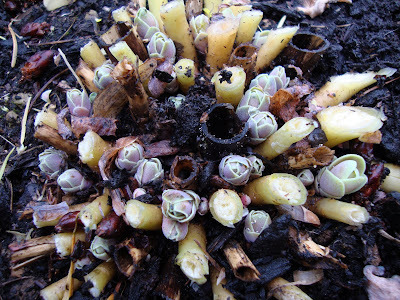 Already they're producing the new shoots ready for next spring. I love the look of yucca but worry about the sharp tips. It ain't called 'Spanisg dagger' for nothing.